Cherries are such a sweet edition to the homestead larder! You can make pies and other desserts, use them in glazes and sauces for savory applications, you can add them to fruit salads, or green salads. There isn’t much you can’t do with a cherry. 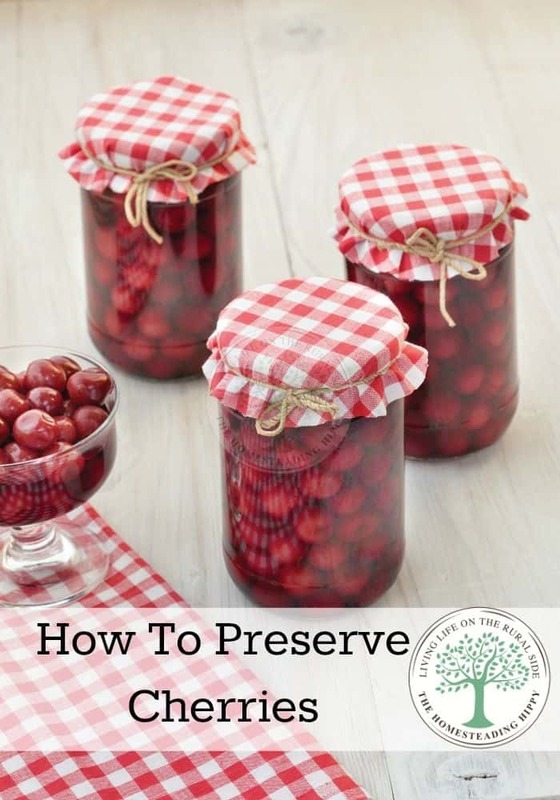 Here are 4 ways of preserving cherries to save some of these babies for winter. 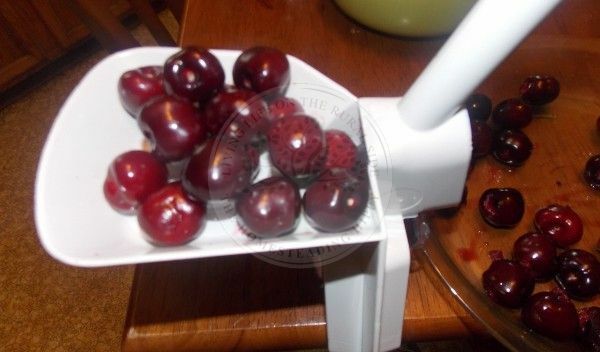 First, for all 4 methods, you will want to wash and pit your cherries. If you have a pitter, this makes the process go quickly. Alternately, you can leave the pits in, but you will want to prick each cherry with a pin to avoid browning. Gently heat the pitted, or pricked, cherries in a light syrup of 1/2 cup sugar to 2 quarts of water. When they are beginning to boil, and all the sugar has dissolved, put into clean, hot jars. Wipe the rims, add your hot lid and band. Pressure can them at 5 pounds pressure for 8 minutes pints or 10 minutes quarts. If you add both sizes at the same time, go with the longer times. Let canner cool, remove jars and wipe off. Store in cool dry place for up to a year. I lay mine on single layer on a freezer paper lined baking sheet. Place in the freezer for 12-24 hours, and then place in an air tight bag for up to a year. These are great for muffins, smoothies, or adding to pies later as well. I use them in the same way as I would use fresh. Simply place in a single layer on a dehydrator sheet and place in a dehydrator (this is the one I use) for 12-4 hours on medium high. Store in an air tight container. Perfect for snacking, granolas, and trail mixes. They will pack great in a bug out bag or to take with you for camping as well. 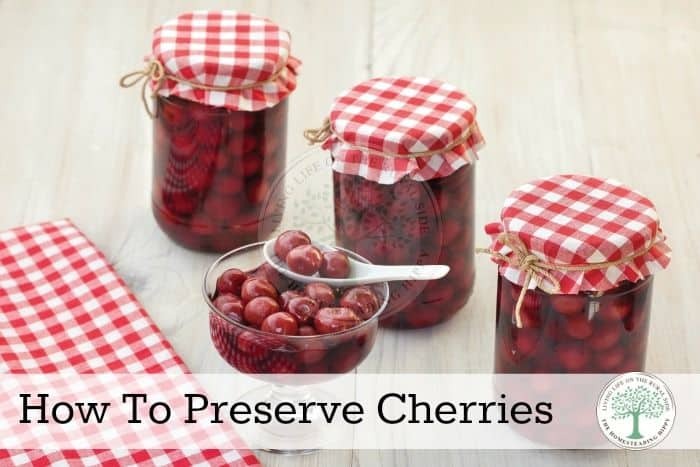 Place the pitted cherries in a clean quart sized jar. Add one cup of sugar and 2 vanilla beans, cut in 1/2. Fill to 1 inch with your favorite rum or brandy, being sure to cover all the cherries. Cap tightly, and gently shake to mix. Place in a cool, dark place for at least 6 weeks, then they will be ready. Great for serving over ice cream or homemade yogurt as a cordial type dessert! Awesome for hostess gifts as well. I presume by their color these are sweet cherries? You don’t use these for pie do you? I use them for pie when that’s all I have…it’s hard for us to find sour ones locally. I’ve never canned cherries. Must give it a go! I actually prefer making my cherry pies with sweet cherries because they don’t require so much sugar as the pies with sour cherries. We had several cherry trees growing up. Our favorite way to preserve was freezing. Thanks for sharing.